Here's a slideshow I put together for Chana's birthday a couple of years ago for her birthday. Obviously I'm biased, but I love this slideshow, and I could watch it over and again. The combo of song ("Comfortable", by Fleming and John) and images is perfect. Hope you enjoy it! We made this in 2003, and I just recently dug it out. We were playing around, and it kinda turned into a video shoot. I love it because it took no coaxing to get the kids to participate. These days, they're much more self-aware. Since I have never blogged about The Police (your eyes may now roll), I thought I'd treat you to a short film my wife Chana put together with our kids and some of our friend's kids. 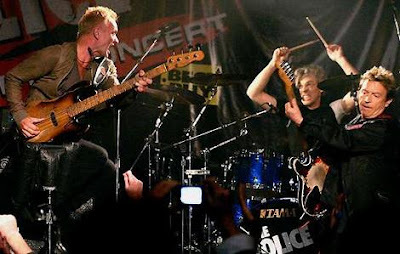 She has always wanted to ask some of these questions to the band (the questions start about halfway through), and since she couldn't get to the band when they came through town, she thought this might one day produce some answers. not a class on blogging. "If we bring a little joy into your humdrum lives, it makes us feel as though our hard work ain't been in vain for nothin'. Bless you all." To celebrate the momentous occasion of reaching 101 posts, I have decided to revisit my three favorite posts I've produced since starting this work of art. 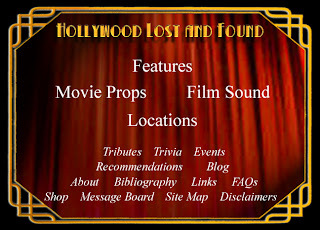 Hollywood Lost and Found is a site I have referred you to a few times as a good source of accurate film sound and history facts. 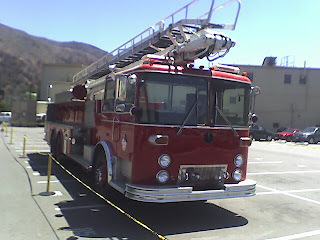 They also have a BLOG, and Steve Lee, the head of Hollywood Lost and Found and seasoned film sound historian, has asked yours truly to be a contributor to it. That's an honor, so I jumped at it. The pressure's on, because I've never "written" for someone else. Well, here goes. Please stop by and check it out. 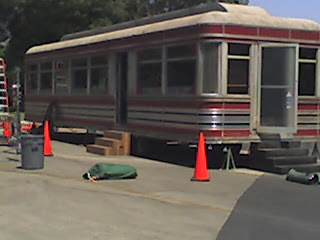 Here are some pictures from the WB main lot. 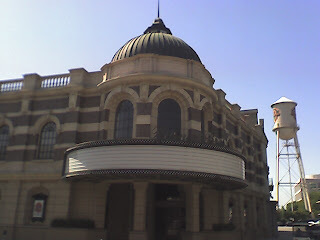 This is the theater. I have always enjoyed walking by this beautiful place. The WB water tower stands in the background, which is now a historical landmark. 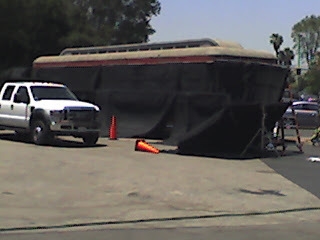 These vehicles arrived yesterday to be used in some unmentionable iconic film. I can't say the name, but the title has something to do with a state in the upper midwest, and it's the fourth film in the series. You're on your own. 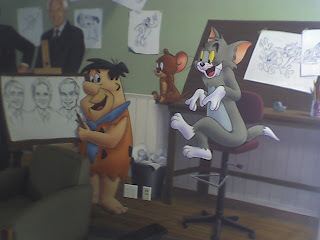 Finally, this is a mural WB Animation had painted. 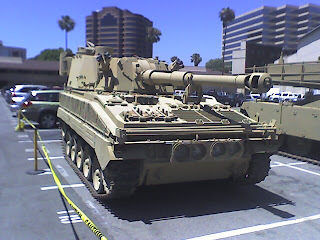 It literally sits just outside my office. My phone camera doesn't do it justice, but the renditions are impeccable. 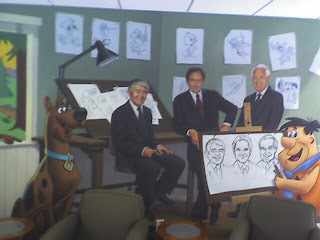 The men are (L-R) Iwao Takamoto, Joseph Barbera, and Bill Hanna. So, obviously this is a Hanna/Barbera tribute. 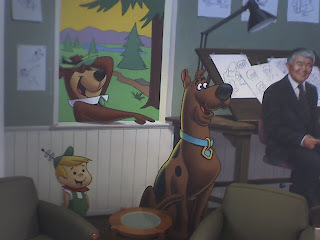 We have other murals with the Warner characters on them, etc, but this one is cool, 'cause it's brand new. 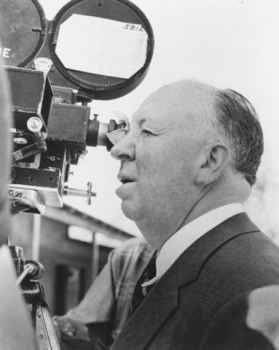 I ran across this site on Kottke.org that discusses Alfred Hitchcock's filmmaking techniques. This is a very interesting read. Hitchcock was an innovator, but he was also a storytelling purist. He was careful not to abandon the cornerstones of good storytelling in order to show us a new camera trick, etc. His motto: keep the story simple. A filmmaker friend of mine, Jason Connell (who also did "Strictly Background") made this short film spoof. Have fun! 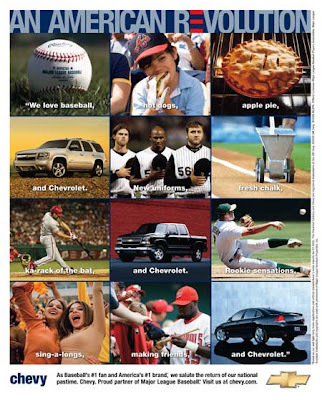 What's weird, is that I've never been a Chevy driver, or a Chevy fan. But when I was a kid, this ad campaign (recently resurrected) was America to me. It meant: the 4th of July, ball games, playtime, parades, friends, summer, etc, etc. At the time, when the commercials were originally running, I never realized that they were instilling in me a pride in our way of life, in our freedoms and values. 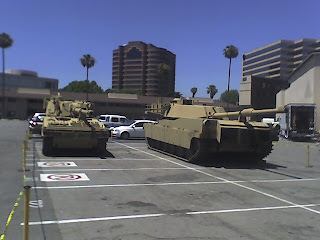 I know they were just trying to sell cars, but the residuals have proven bigger - at least to me. Maybe I owe them a purchase? Everyone has been influenced (whether good or bad) by the advertising of their youth. For me, when I think of the 4th of July, I try to remember to enjoy the freedoms for which we have paid so dearly, and I also usually think of this slogan.